Gobble Gobble! 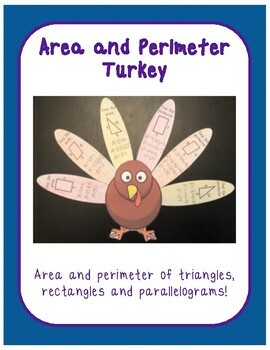 Have your students practice finding the area and perimeter of polygons while getting into the Thanksgiving spirit! Students will find the area and perimeter of a rectangle, triangle and parallelogram in order to complete the problems on the turkeys feathers. Those feathers are then colored in, cut out and glued onto the turkeys body! Color and black and white turkey versions included.